The good folk of Charleston are still fighting off the attacking Espheni from the last episode. Tom takes this opportunity to convince the captured sniper, Lt. Fisher, that the Volm are fighting the Espheni too. This tactic works, and she contacts President Hathaway and sets up a meeting between he and Tom. Unfortunately this means that Tom has to leave just as Hal is trying to make his grand confession. It also means that Tom isn't around when Anne decides to take a DNA sample of little Lexi and find out what is going on with the creepy baby. But before they can leave, Tom and Weaver have to convince Pope to let them use a plane that he has been fixing up. It's apparently an antique, but it's the only one they have. Eventually, Tom, the alien Cochise, Pope, and General Bressler fly off to meet the President. Anne, desperate for help, goes to Dr. Kadar to see if he can devise a way to make a DNA test. She claims it's for the de-harnessed kids, but we all know she really wants to test creepy Lexi. Dr. Kadar gives her a list of supplies, which Anne happily supplies. Poor Dr. Kadar, it's obvious he lost a child in the fighting and it has deeply damaged the poor man. Incidentally, Lourdes has been working on getting the older de-harnessed kids to undergo surgery to remove what remains of their spikes. Their studies would indicate that the spikes are continuing to grow within the kids and they don't know how this will effect them. This group includes Ben and Denny. Ben seems very unsure but bows to peer pressure when Denny says she wants to be normal again, even if that means she'll have to wear glasses. Ben's conflict continues throughout the episode. He seems overwhelmingly worried that without his spikes he won't be useful to anyone anymore. His impassioned speech ultimately changes Denny's mind and she also keeps her spikes. This way they can be useful together. With Maggie out on patrol, Hal is alone when he learns that his father has left Charleston on a mission. This gives him just enough time to stagger back to his room and have a psychotic break in peace. He starts by throwing some things around and eventually ends up leaning on the dresser staring into the mirror. Then his reflection starts talking back to him. Do you remember that creepy smile that crossed Hal's face when the bug crawled into his ear last season? Well, he's back. He proceeds to tell Hal how all those nights in the woods with Karen were not, in fact, dreams. He goes on to explain how Hal is not going to tell anyone about them. Hal finally punches the mirror, breaking it, to shut him up. Only when he looks up from the broken glass, it's Hal 2.0 that's standing there. He smiles his evil smile and saunters out the door. He happens upon Maggie returning from patrol and wastes no time in telling her that she was right. He's not going to tell Tom about the Karen stuff, it was all just a bad dream. She smiles relieved, and they go back to their room for some strenuous making out. Hal continues to smile his evil smile. 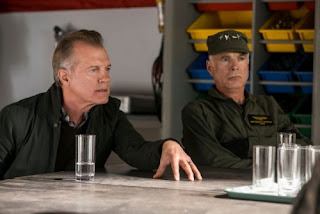 Tom and cohorts finally make it to see the President (Stephen Collins from 7th Heaven)and are met first by General Donovan (yay, Michael Hogan from Battlestar Galactica). He and his soldiers were quite angry to see that Tom brought an alien with him. They go to restrain him, and attack Tom when he tries to stop them. Finally the President himself appears and gets them to let Tom out of the dirt, but Cochise is lead away under restraint. Tom, Bressler and Lt. Fisher eventually convince Hathaway to speak to the alien himself. Cochise paints them a tragic picture of his people. When asked what he is fighting the Espheni for, he replies simply. “A flower”, he says. It seems that the Volm have never seen their homeworld except in data files. His brother told him about a flower that only grows in a single place there, and that is what he is fighting for. He hopes that someday his grandchildren might get to see the home he will never live to see. This appears to soften the President's heart a bit and he seems a little more open to the idea. Unfortunately Donovan interrupts with news that Espheni ships are on the way and they have to leave now. Against Tom's wishes Cochise is loaded into a plane with the President, while he, Pope and Bressler return to their old antique. As the Espheni ships move in, the President's plane appears to be hit and goes down. Bressler does his best to evade the Espheni, but they are also hit and crash in the woods. Lourdes has been watching Lexi. She does an excellent job of playing it cool, and invites Lourdes to finish a bottle of wine with her. Lourdes agrees, but quickly slumps to the floor after her first sip. Anne drugged it of course. She grabs her backpack and creepy Lexi and heads out of town. Somewhere in the rubble of the city, she runs into a skitter and it's dirty harnessed kid. They greet her and Lexi by name and smile creepily at her. She anxiously turns around to run away, but Hal 2.0 is standing behind her. He tells her not to worry while flashing his evil smile. The next episode of Falling Skies, “Search and Recovery”, airs June 23 at 10 PM ET on TNT.